is designed for fast and comfortable operation. Extra ease is provided by contoured Plus/Equal and Minus/Equal keys. prints 10 numerals, 2 symbols, and 3-digit punctuation at a speedy, approximately 4.3 lines/sec. in 2 colors (positive numbers in black, negative numbers in red) on standard size paper rolls. simplify many business calculations. Also included are memory clear, recall, plus, and minus entry keys. A MU (Multiple Use) key simplifies business calculations to save time and increase efficiency by handling functions like margin, markup, selling prices, costs, percent changes, etc. keeps track of the number of entries made, simplifying average-calculations. 17.0 mm easy-to-read bright blue fluorescent display with automatic 3-digit punctuation. 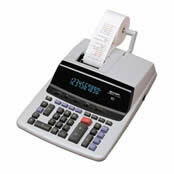 include automatic tax calculations, plus and minus entry keys, constant mode selector, add mode, round-off/up/down selector, change sign key, paper-saving print/non-print selector, and a fold down paper holder. This page is part of GeneralManual.Com Network SHARP VX-1652H Commercial Calculator User Manual.